Order this online gift of Scrumptious Birthday Selection Hamper of Nuts N Chips and make the events of your close ones more special from miles away. 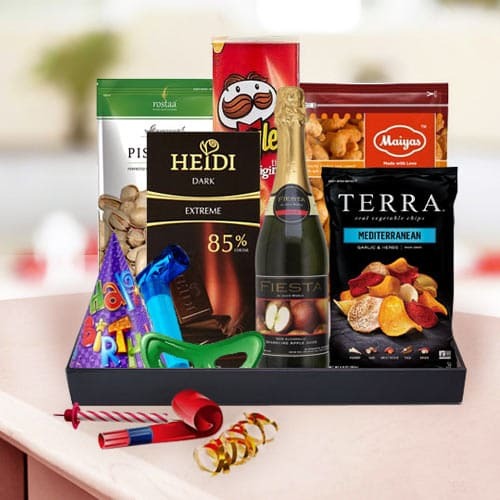 This delightful Gift Basket is filled with Pistachio (Net Wt-200 gm), Masala Cashew (Net Wt-200 gm), Feista Sparkling Fruit Juice, Pringle Chips, Heidi Chocolate bar and Mediterranean Chips. All these products are carefully packed in a Tray with Birthday Party Accessory.